The phrase nanotechnology is everywhere these days and it seems that this technology will transform our lives. It now appears that it may also transform surgical procedures and especially dental surgery. Back in 2006, a Post Graduate Student of the Meenakjhi Ammal Dental College in Chennai, India called Saravana Kumar wrote a paper on the future of Nanodentistry. He looked into his crystal ball and foresaw a future where nanorobots would allow instant diagnosis and extermination of pathogens and individual cell surgery in vivo. This would enable maintenance of near-perfect oral health. Nanorobots would flood the mouth through oral mouthwash and be controlled by the dentist to switch off sensation prior to procedures and even move teeth within minutes or hours. It seems, thankfully, that progress is much slower and science has focused on the application of nanocomposites primarily aimed at reducing infection after procedures such as Root Canal Therapy. Thousands upon thousands of root canal treatments take place every year in the UK. The purpose of root canal treatment is to treat infection at the centre of a tooth caused by bacteria that live in the mouth. The root canal system contains the dental pulp (soft tissue at the centre of the tooth) and the pulp contains nerves and blood vessels. Essentially root canal treatment is needed to save the tooth from being extracted. After the bacteria is removed, the root canal will be filled and sealed. If done correctly then the tooth may survive for a further 9 to 10 years. The filling used is a polymer called gutta percha which does not react within the body. Gutta percha cannot fight infection and if any bacteria is left in the tooth untreated, then further infection can arise. This invariably leads to additional root canal treatment or extraction. Even root canal treatment carried out to an appropriate standard can fail. Researchers at University of California, Los Angeles School of Dentistry investigated the use of nanodiamonds. The researchers suggested that “may offer unique advantages due to their favourable properties, particularly for dental application” They carried out tests and filled some human teeth with gutta percha strengthened with nanodiamonds and some teeth with gutta percha strengthened (enhanced) with nanodiamonds with antibiotics. The study showed that the enhanced filling was very effective at preventing bacteria growth. The plan is to take this forward into formal clinical research. There are also tests underway to experiment with nanodiamonds stimulating bone and cartilage regrowth in teeth. This technology may well help us all in the future to keep our teeth and prevent extractions. 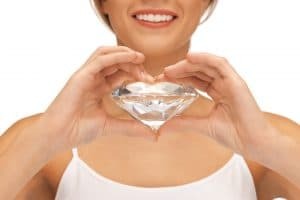 What is yet to be seen is if nanodiamonds will help you achieve a sparkling smile.